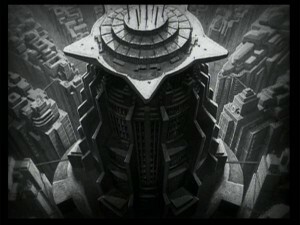 Metropolis tells the story of a city in the future and the people who build and inhabit it. The inhabitants are divided into two classes: the industrialists and city dwellers, who plan, design and occupy the uppers levels of the city, and the workers who build and maintain the city’s functions and live below the machine level. The standards of living between the two classes are distinct and unjust. Life among the “top dwellers” is shown to be gay and carefree. They participate in games and sports, attend the theater and frolic in parks, while life among the “workers” is barely livable, as they drudge from one day to the next performing physically taxing tasks and duties in order to maintain the city’s power and resources. Towers ascend to dizzying heights. Cars and public transport travel between mammoth structures on trams and byways that connect the buildings in a labyrinth of man-made objects. The city represents the ultimate in man’s achievement, but in it we see the price of building and sustaining such an accomplishment. The workers’ confidant, Maria (Brigitte Helm), aspires to see a life that one day will be realized by the workers. Freder (Gustav Frohlich), the son of the chief industrialist, discovers Maria and follows her as she descends to the lower depths of the workers’ dwellings. Soon after arriving to the lower levels, Freder is distracted from his pursuit of Maria by the activity of the machine works. He witnesses men working under terrible conditions and, as if this was not bad enough, a huge accident occurs and several workers are killed. Appalled by this sight, Freder returns to the “Top World” to confront his father, Joh Fredersen (Alfred Abel), the top industrialist and the man most directly responsible for the workers’ plight. Fredersen’s response is apathy towards the workers, who he feels are “in the depths where they belong.” Maria attempts to inspire faith among the workers that their suffering will soon come to an end because of her belief in an eventual and benevolent force of balance. This is explained by her statement, “The Mediator between the Head and the Hand is the Heart.” Feeling threatened, Fredersen quickly formulates a plan to act against Maria. Fredersen and his head scientist, C.A. Rotwang (Rudolf Klein-Rogge), with whom he has a long rivalry over Fredersen’s dead wife Hel, hatch a plan to stop Maria by replacing her with Rotwang’s roberter, his human-like robot built to replace Hel because it is able to take human form. Rotwang reveals to Fredersen that it can take the place of his human workers. With the roberter acting as Maria, it will incite the workers to violence so he may justify violent action against them and then replace them with more of Rotwang’s roberter. When Fredersen captures Maria, Rotwang transfers Maria’s appearance to the roberter in one of the most visually remarkable scenes in film history. The “evil” Maria descends to the catacombs and begins to deliver her message to the workers that their “mediator” is not coming and never will. As the roberter begins to incite the workers to violence, Josaphat (Theodor Loos) returns to Freder’s apartment to inform him of what Maria is doing. Refusing to believe it Freder, hurries to the catacombs to see for himself. When he arrives he discovers the impostor and a massive brawl ensues. 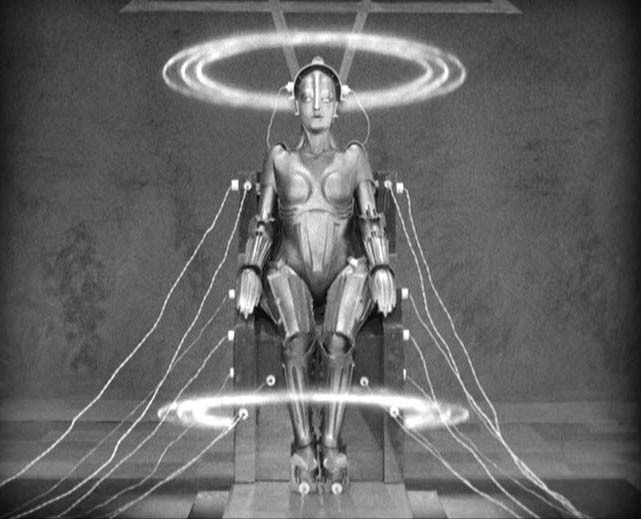 Freder survives and the enraged workers leave to destroy the machines of Metropolis. Aware of the danger, Grot (Heinrich George), the city foreman, contacts Fredersen and informs him of the mutiny and that if the workers destroy the heart machine, the worker’s city will be flooded. During the mayhem, the roberter flips the switches that will insure the heart machine’s destruction. As the heart machine begins to break apart, water begins to flood the workers’ city. In a scene never shown and perhaps edited from the original print, the real Maria escapes from Rotwang and returns to the workers’ city to find the flooding. She rings the giant bell in the center of the workers’ town and gathers all the children. She is soon joined by Freder and they begin to help the children escape though the vent shafts. As the destruction continues below the surface, Fredersen witnesses the lights and functions of the topside go dark. His subordinates arrive to report the damage but Fredersen is unmoved until he hears that his son is missing. At the same moment, Grot is finally able to get the attention of the rioting workers and ask them where their children are. The workers erupt in anguish as they realize that their children were in the workers’ city when it was flooded. Soon they rally behind Grot as he gathers the mob to hunt for Maria, who incited them to the violence that apparently cost them the lives of their children. The roberter Maria leads a mob of “Top Dwellers” into the street as they clash with the worker mob. The worker mob apprehends the “evil” Maria and proposes to burn her at the stake. They assemble a pile of trash in the center of the city and bind the doomed roberter to the stake. Next, Maria appears as she is being pursued by Rotwang, a scene that was omitted from the un-restored versions of the film. According to the original script, Fredersen arrives where Rotwang is holding the imprisoned Maria. Rotwang declares, “Joh Fredersen took the woman from me. He made me evil … but I will defy the will which is above you and me. I will open the doors for you … If you give me your hands I will go with you into the City of the Dead, so that you can warn your brothers, so that you can unmask your stolen ego.” At this point in the original screenplay, Joh attacks Rotwang and Maria escapes. Rotwang continues his pursuit of Maria into a cathedral facing the street, where the mob has burned the roboter Maria. As Fredersen and the mob look on, Freder battles with Rotwang on the roof of the cathedral. During the fight, Rotwang looses his balance and falls to his death. Fredersen greets his son at the main entrance where they are joined by Maria, Grot and the mob. There is a moment when Grot and Fredersen attempt to embrace but have difficulty; Freder, noticing this, joins their hands. 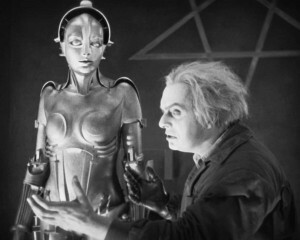 Metropolis remains one of the most talked about, written about, re-edited, and influential silent and science fiction films ever made. It has been the standard set for science fiction and fantasy film epics, influencing the design of more recent films like Ridley Scott’s Blade Runner (1982) and Tim Burton’s Batman (1998). It was not a box office success and has even been listed as one of the worst films ever made, in Harry Medved, Michael Medved and Randy Dreyfuss’s 1978 book, The Fifty Worst Films of All Time (And How They Got That Way). 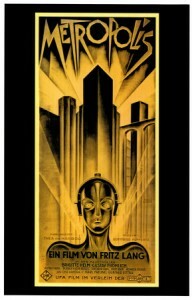 It is difficult to find criticism of the film’s visual accomplishments; on the other hand, it is just as difficult to find positive criticism of Metropolis as a story. The bulk of the criticism attacks the premise as simplistic and too unbelievable. Critics also attack the film because of its religious references, such as the “Tower of Babel,” the center structure and home to Joh Fredersen. British science fiction writer H.G. Wells dismissed the film’s portrayal of human struggles in the form of indentured slavery. It has also been criticized for not formulating a believable and interesting story to support its message of unity and overcoming division. “Unfortunately,” say Gerald Mast and Bruce Kawin in their textbook A Short History of the Movies, “Metropolis is all eyes and no brain, all visual with no convincing vision.” However, when I recently watched a restored version of the film, I was extremely pleased. It seems to me that the film attempts to make a point about how a dystopian future can be transformed into a possibly positive future. I think Lang wanted to show the magnificence of what human ingenuity could achieve. The reports of his trip to New York could have been inspiration for the film, but even if it was not, he showed a distinct vision of what he thought the future could look like. It is a clear example of German Expressionism, but it adds one dynamic dimension not allowed by painting: movement. Screenwriter Thea von Harbou was, I feel, motivated by seeing a balance develop between people who run industry and the disadvantaged who make up the majority of society. Whereas such cases of change had usually ended with those involved resorting to violence, I think von Harbou was compelled to present a way for reconciliation to occur between the two without resorting to this destruction. Both von Harbou and Lang were witnesses to a German society that had been put through extreme poverty and blight during that time. It is plausible to suspect that this inspired certain aspects of the portrayal of human blight in the future seen in the workers in Metropolis, in the form of physical torment. In the film, the workers’ suffering is unquestioned and it is apparent that this suffering is going to lead to a revolt. The film makes a case for peace by showing the reality of how difficult it is to sell the idea of non-violent protest to the suffering. There are many references to religious symbols and language in the film. I believe these references are vehicles for expressing more complex issues in communicating the idea of benevolence and goodwill, and how they can exist and prosper in an advanced and futuristic society that endures change. Or von Harbou could simply be saying, “Wouldn’t it be wonderful if they did?” I have read many reviews that see the religious references in a critical manner, but I don’t think what they point to is clear. I do not believe von Harbou or Lang were trying to sell the idea of Christianity, nor do I believe they were plagiarizing the Bible. I do believe they could have been religious people and were motivated by things they may have learned through practicing their beliefs. However, I don’t think that this is what the film is about. This film is about humans from different states of society learning to live, work and prosper together. This idea is not new, complex, or even necessarily consistent with the way von Harbou and Lang lived their lives, but I do think it is a message just as meaningful and difficult to comprehend as ever.